60th birthday present ideas command a little consideration. They should memorable and meaningful. There's a expectation that once you reach the age of 60, life should be taken a little slower. Many people will start to look forward to retirement if they haven't already retired. 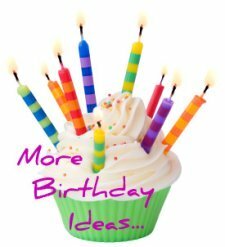 Here's my top five 60th birthday present ideas. Get them in the celebration mood by buying a decent bottle of bubbly. Most people enjoy a glass of champagne and what better way to celebrate a milestone birthday. Of course once it's gone, it's gone! So present the champagne with an engraved champagne glass, either with a special message or you can buy '60th birthday' commemorative glasses, a lovely keepsake of their 60th milestone celebration. This would certainly be a cherished gift, and truly unique gift ideas for a 60th birthday. The number can be transferred to any car so the gift would last a life time, and further more it also makes a timely investment. Do they like art? 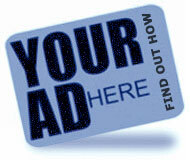 See if you can find a suitable hand painted custom art. Would they love a countryside scene or something more abstract. You could even consider having a painting commissioned from a photograph. Perhaps a pet or wildlife portrait, a painting of their house, or perhaps a place or scene they particularly like. Again this would be a unique gift that would last a lifetime. Getting older, seems to generally signify spending more time in the garden, so why not buy a garden gift. Perhaps a shrub or tree to mark the milestone, you can even have a rose named after them. A garden ornament or statue would make a good gift. I commissioned a chainsaw carving for my Mum's 60th Birthday. 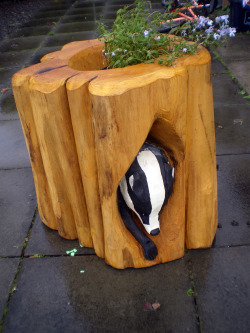 It was a planter with a badger climbing out of it (she loves badgers!) It has pride of place in her garden. 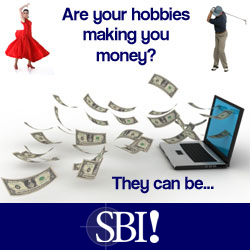 I often find that unique and personal gifts are usually related to some-one's hobbies or loves in life. My Mum is an avid dog trainer, for her last birthday she received a set of dog jumps! 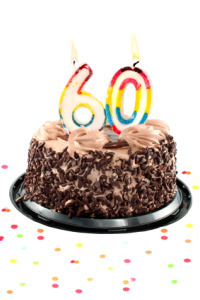 If you've been pondering over perfect 60th birthday present ideas, I hope this has given you some inspiration.